Bosch offers a range of mounting options and power supplies for the UML Series flat-panel monitors. The Bosch series of Universal Monitor Mounts (UMM) are designed to mount any VESA®-compliant monitor to a wall or in a rack-mount cabinet, up to 12 kg (26.5 lb) in weight. The wall mounts offered in the series of Universal Monitor Mounts (UMM) are the UMM-LW-20B, the UMM-LW-30B and the UMMWMT-32. The rack mount is the UMM-LCDUB-RM. 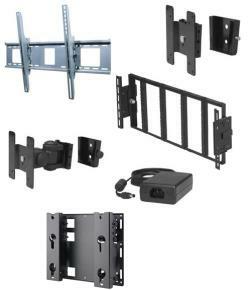 The ST650 wall mount is ideal for mounting a 37-inch to a 60-inch LCD screen to a wall. The one-touch tilt feature allows adjustment of ±15° without the use of tools.